driven by a narrative that originates in Ambli, Ahmedabad travels to Venice, Italy, and ends in London, England. The Studio shall operate in collaboration with IDEA Indus University, Intersection and Conflictorium. 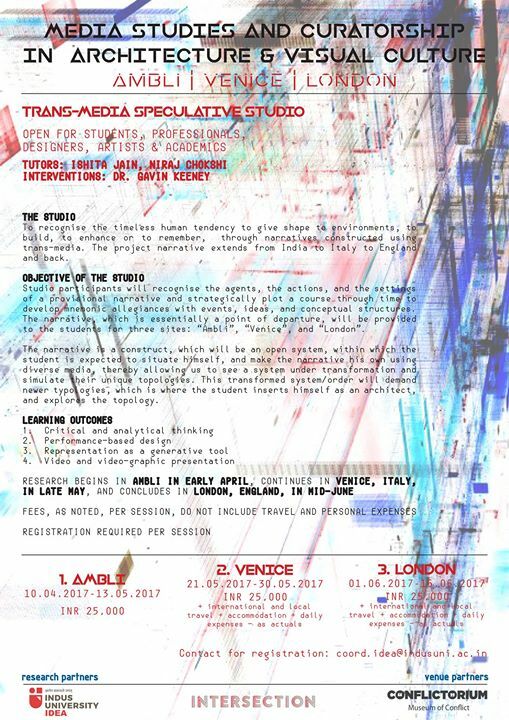 The project is an exploration of the timeless human tendency to give mould his environment, through narratives constructed using trans-media. The project narrative begins in India, extends itself to Italy and England and back, over the months of April, May and June. Registrations can be made for each session separately, or for combined packages of sessions as well.